It’s one of the only ways where I can allow myself to be reminded that there really are other people who feel the same way. It’s a source of peace and comfort, albeit small. Throughout the years, I have collected the secrets which resonated with me so that I can always go back and think there’s at least one other person who feels like this and this is proof. Inspired (okay, inspired isn’t the right word…), I wanted to express another angle of this secret, so I created my own PostSecret. Thanks to stringent copyright laws, I’m certain that this will never be able to be published, but it gave me a more creative outlet to express what now feels like. 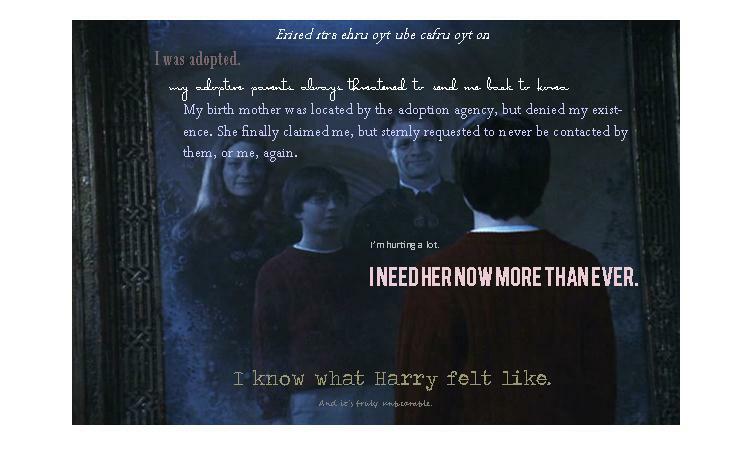 This entry was posted in thesearch and tagged adoption, birthparents, holtinternational, korean, love, postsecret, quotes, reunion, search, self, southkorea by searchingsearcher. Bookmark the permalink.